The country’s leading agitprop network, CNN, held a “town hall” event earlier this week ostensibly to ‘have a conversation’ with politicians and the country’s largest gun-rights organization following another horrific school shooting — this one in south Florida. Turns out the event was more Salem Witch Trial than conversation. It turned into a forum for angry Leftists to spew hate and venom at Sen. Marco Rubio, R-Fla., and National Rifle Association representative Dana Loesch. The Salem Witch Trial reference is not hyperbole, by the way. In fact, the hate was so bad (aren’t liberals the ‘tolerant, peaceful’ ones?) that Loesch would tell an audience at the annual Conservative Political Action Committee meeting the next day that she had to be escorted out by private security. Otherwise, quite literally, crazed, angry Leftists may have actually burned her right there on a stage that CNN built. As reported by The National Sentinel, Loesch blasted CNN and the rest of the American Pravda media during her speech at CPAC for focusing, again, on exactly the wrong thing as it pertains to actually solving the growing epidemic of school shootings: A Republican senator and the NRA. Oh, and guns. You know, instead of, say, the FBI for failing to act on two tips that shooter Nikolas Cruz was a threat and planning to do something like what he did. Or, say, local police, who were called to a home where Cruz lived nearly 30 times in the days, weeks, and months before he allegedly killed 17 people at the Parkland, Fla., school. Or, say, students themselves, many of whom knew Cruz and suspected he would someday become a threat. “I want to make this super obvious point,” Loesch said. “The government has proven that they cannot keep you safe. And yet, some people want all of us to disarm. You heard that town hall last night. They cheered the confiscation of firearms. And it was over 5,000 people. “There were people rushing the stage and screaming ‘burn her.’ And I came there to talk solutions and I still am going to continue that conversation on solutions as the NRA has been doing since before I was alive,” she continued. As is always the case with the Marxist Left, this particular incident does not come without massive hypocrisy. 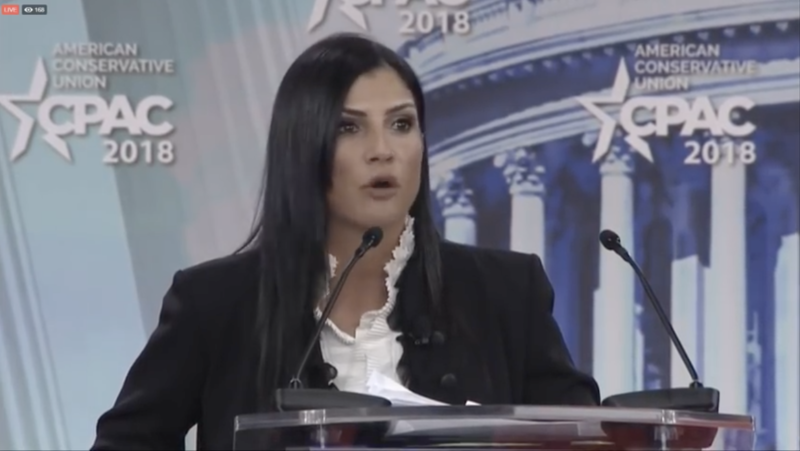 During her speech, Loesch also noted that some of the very same people who call President Donald J. Trump an authoritarian-in-waiting now want him to do one of the most dictatorial things he could possibly do. “And then they also call Trump a tyrant but they say they want the president to also confiscate our firearms? Try to figure that one out,” Loesch said. We can’t figure it out, Dana. It’s the Left; what they say and what they do most often makes little sense. Loesch also called out CNN for intentionally hosting such a rowdy event, where most attendees were only there to shout at her and [Rubio], not discuss practical solutions to school shootings. She also called out the “legacy media” for refusing to hold similar “town halls” for “sanctuary cities” that lose citizens to illegal aliens or “grieving black mothers in Chicago,” where mostly young black men are gunned down daily. None of that matters to the Communist News Network. They’ve got a witch to burn, no questions asked.